What Is DA Form 5118? DA Form 5158, Reassignment Status and Election Statement is a form used at the beginning of the Soldier’s reassignment cycle or as a basis for initiating specific assignment processing. This specific assignment processing includes deletion, deferments, additional service and any other special processing. The latest version of the form - sometimes incorrectly referred to as the DD Form 5118 - was released by the Department of the Army (DA) in October 2012 with all previous editions being obsolete. An up-to-date DA Form 5118 fillable version is available for download and online filing below or can be found through the Army Publishing Directorate website. The DA 5118 is used to conduct the initial pre-reassignment screening to determine the Soldier’s eligibility to comply. Disclosure of any personal information is voluntary, but failing to file will result in unnecessary delays in reassignment. Title 10, USC, Sections 3010, 8012 and 5031, and Title 5, USC, Section 301 and E.O. 9397 (SSN). initiating specific assignment processing (deletion/deferments; additional service; or any other special processing required). Soldier and/or Family members. Failure to disclose data will not automatically exempt Soldier from selected reassignment. check the "N/A" block. 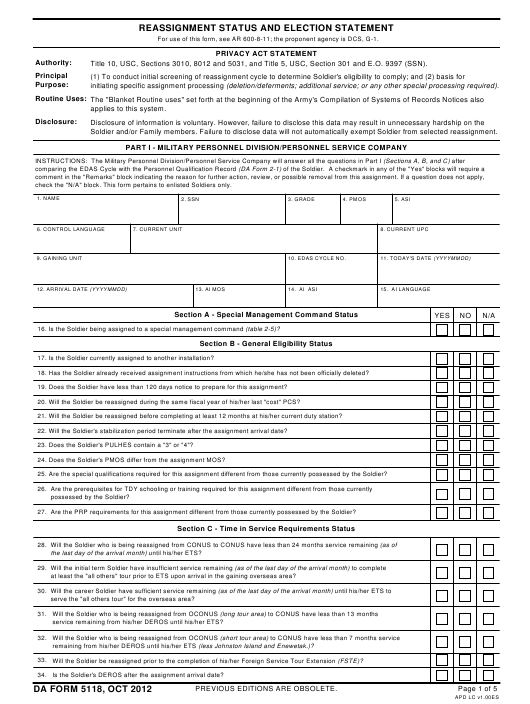 This form pertains to enlisted Soldiers only. 16. Is the Soldier being assigned to a special management command (table 2-5)? 17. Is the Soldier currently assigned to another installation? 18. Has the Soldier already received assignment instructions from which he/she has not been officially deleted? 19. Does the Soldier have less than 120 days notice to prepare for this assignment? 20. Will the Soldier be reassigned during the same fiscal year of his/her last "cost" PCS? 21. Will the Soldier be reassigned before completing at least 12 months at his/her current duty station? 22. Will the Soldier's stabilization period terminate after the assignment arrival date? 23. Does the Soldier's PULHES contain a "3" or "4"? 24. Does the Soldier's PMOS differ from the assignment MOS? 25. Are the special qualifications required for this assignment different from those currently possessed by the Soldier? Are the PRP requirements for this assignment different from those currently possessed by the Soldier? the last day of the arrival month) until his/her ETS? at least the "all others" tour prior to ETS upon arrival in the gaining overseas area? serve the "all others tour" for the overseas area? service remaining from his/her DEROS until his/her ETS? remaining from his/her DEROS until his/her ETS (less Johnston Island and Enewetak.)? Will the Soldier be reassigned prior to the completion of his/her Foreign Service Tour Extension (FSTE)? Is the Soldier's DEROS after the assignment arrival date? completed Soldier Status and Election Statement attached. Is the Soldier currently attached to another installation for the purpose of processing a personnel action? Is the Soldier currently assigned to another unit? movement such as a REFORGER)? Is the Soldier in an AWOL status? Is the Soldier presently confined? Is the Soldier presently undergoing any medical or dental treatment that would prevent this reassignment? Is the Soldier awaiting court or trial appearance as a defendant? Is the Soldier pending an early release from active duty? Is the Soldier pending a Medical Evaluation Board (MMRB/PEB)? Is the Soldier pending a PMOS reclassification? Is the Soldier under suspension of favorable personnel actions (FLAGGED)? Is the Soldier enrolled in phase III of the Alcohol and Drug Abuse Prevention and Control Program (ADAPCP)? Is the Soldier scheduled for any schooling not in conjunction with this assignment? Has the Soldier applied for specialized training? aware of any medical conditions that would prevent me from worldwide deployability. "Remarks" block indicating the reason for further action, review, or possible removal from this assignment. If a question does not apply, check the "N/A"
block. You must sign the completed statement and return it to the Battalion S1. Do you have an approved retirement date? If you are being assigned to an airborne position, do you wish to terminate your airborne status? Do you have an enlistment or reenlistment commitment for other than the areas of this assignment? Are you a pregnant Soldier? Are you a sole parent or married to an Army Soldier? Do you have an extreme Family situation that meets the requirements outlined in table 2-1, AR 600-8-11? enrolled in the Exceptional Family Member Program? imprisonment or conviction by a foreign tribunal? Do you desire to report in early to the gaining oversea command? participate in the Homebase Assignment Program? participate in the Advanced Assignment Program? A" block. You must sign the completed statement and return it to the Battalion S1. Have you applied for Conscientious Objector status? Are you a sole surviving son or daughter? resulted in death, disability, missing in action, or prisoner of war status? Are you a former Peace Corps member being reassigned to the country in which you have served? Are you a former Prisoner of War or Hostage being reassigned to the country where you were held captive? Have you been hospitalized at least 30 days outside a hostile fire area due to a wound received in that area? The 5118 DA form consists of four main parts. Part I (Military Personnel Division/Personnel Service Company) is filled after comparing the EDAS cycle with the Soldier’s Personal Qualification Record (DA Form 2-1). The first section is unnamed and requires the Soldier to enter their name, social security number, grade, primary military occupational specialty (PMOS) code, additional skill identifier (ASI), and control language and provide information about their current unit, gaining unit, the Enlisted Distribution Assignment System (EDAS) cycle, the date of filling the form and the arrival date. The rest of Part I is divided into Sections A through C filled by the Military Personnel Division or Personnel Service Company and certified by the reassignment clerk. Part II (Battalion Status) is filled by the battalion commander's principal staff officer. The Soldier fills in only Items 1 through 15 and the officer fills in the entire Sections D and E. At the end of Part II, the battalion commander signs and dates the form before returning the form to the MPD or Personal Service Company with a completed Soldier Status and Election Statement attached. Part III (Soldier Status and Election Statement) is filled in by the Soldier. Section F refers to the Soldier’s personal status, Section G requires information on the Soldier’s OCONUS (Outside the Continental United States) status. Each positive answer should be clarified in the Remarks box at the end of the form. When Part III is complete, the Soldier signs and dates the section and continues to Part IV (Wartime Status). The signed and completed DA 5118 Form is then handed in to the battalion S1.